On a recent co-op trip, I picked up a carton of MimicCreme under the mistaken impression that it would make good vegan whipped topping. After finding out that this particular variety does not, in fact, whip, I contemplated returning it. But then I thought about how long it’s been since I last had a good cream sauce, and that started me pondering recipes. When I first went veg, my absolute favorite cookbook was The Clueless Vegetarian by Evelyn Raab. For the budding vegetarian, it was an invaluable resource, and I got a lot of enjoyment out of it before going vegan. Since then, I’ve sort of neglected it. Despite how useful it was to me, it is a book from an era when things like butter and oil were used in excessive amounts, and a lot of the recipes contain a rather astonishing amount of cheese. However, I remembered it having several recipes with some type of cream sauce, so I pulled it out again, looking for something to use the MimicCreme in. 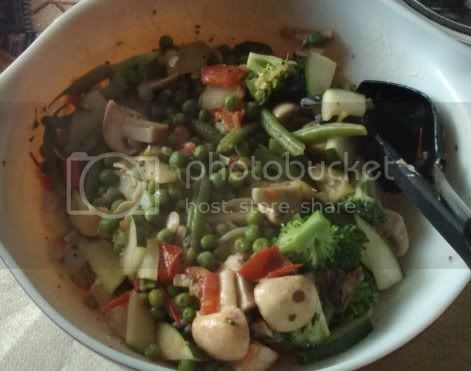 I came across Fully Loaded Pasta Primavera and fell in love. I adapted it a bit to cut out the oil and butter and to work with the veggies I had in the fridge, and this is what I came up with! If you want to make it gluten-free, use brown rice pasta. 1) Cook the pasta according to package directions. Drain, rinse with cold water, and drain again thoroughly. Transfer to a large mixing bowl and set aside. 2) In a large pan with a steamer basket, steam the zucchini, broccoli, green beans, and peas, covered, until just tender-crisp; about 2 minutes. Remove from heat and set aside. 3) Place the garlic, tomatoes, and mushrooms in a large skillet or saute pan over medium heat and cook, stirring, for about 1 minute. 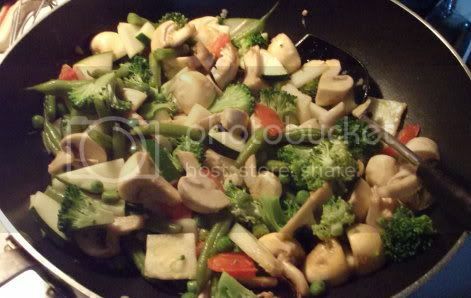 Add the steamed veggies and cook until heated through, but not overcooked. Add small splashes of water if anything starts sticking. 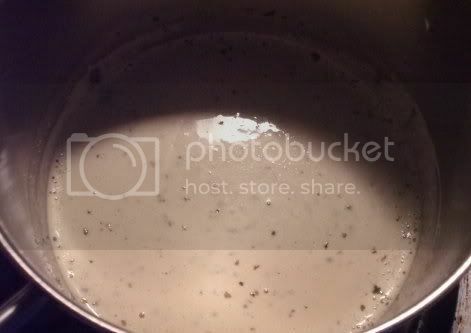 4) For the sauce, place the cream, Parmesan, and Italian seasoning in a large saucepan over medium heat and whisk until smooth. Continue to cook, whisking occasionally, until the sauce is smooth and heated through. 5) Pour the sauce over the pasta in the serving bowl and toss to coat. Add half the veggie mixture and toss again. Season to taste with salt and pepper, if desired, and top with the remaining veggies. Serve warm. Something interesting for me to try! Haven’t had faux cream or vegan parmesan. 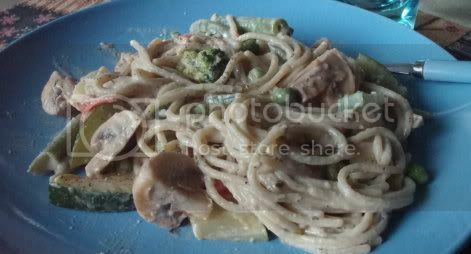 Here’s a vegetable pasta dish I made that was really good. Mmm, that recipe sounds awesome! I love pasta/veggie dishes, and I especially love anything with garam masala, lol. This looks amazing. I am such a sucker for creamy (albeit faux creamy) pastas. Yum! Me too! I missed cream sauce like crazy when I first became lactose intolerant.